Meet Daruma-San, a new friend of mine. Daruma are hollow, round Japanese dolls depicting Dharma(the founder of zen Buddhism). They are considered omens of good luck and come in a variety of designs and colours depending on region, the one pictured here is one of the most common designs. 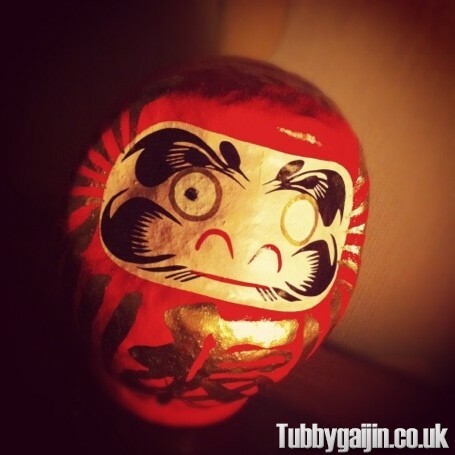 Traditionally, Daruma were considered to be toys, however these days the main purpose of purchasing one is as a reminder of a goal you’ve set yourself. When you buy a Daruma, they have no pupils and it is for you to paint one in when you set a goal, and the other when you come to complete it! At the end of the year, people return their Daruma to the temple where they purchased it for a ceremony called Daruma Kuyo where after expressing gratitude it is handed back to the temple monks to be ceremonially burned along with thousands of others. Seeing as I purchased mine from the Japan Centre I obviously won’t be participating in such a ceremony! As you can see, this guy is still without a second pupil, but one day he’ll get his full vision!